The Moon - that inconstant orb; a glorious bright light in our night sky; an ancient vehicle for human myths and deities; and now a world become known. For thousands of years before the rise of the scientific method, humans gazed at Earth's one natural satellite, wondered at its nature and worked it into their stories as they struggled to understand their universe and its impact upon them. The Standing Stones at Calanais, Scotland, an ancient lunar computer. 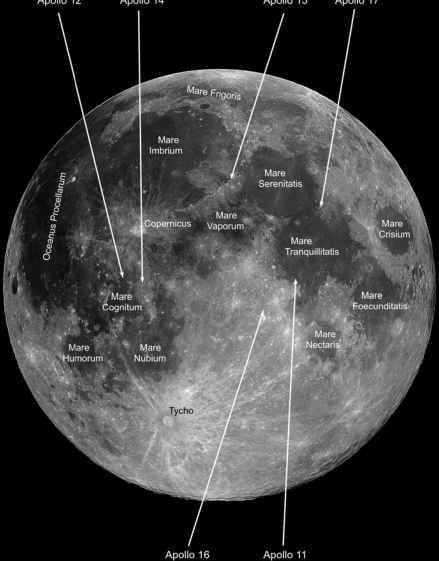 The face of the Moon, its major features and the Apollo landing sites. imbued the Moon with a spiritual significance that caused them to devote major resources to its construction.